I've been buying "Hwy 29" snap hot dogs since my college days (~40 years), when Mr. Salmon ran the operation. And his sons do a great job too, stepping into their father's footsteps. Whenever I am within 50 miles of the Luxemburg operation, I make a point of buying a box of the natural casing weiners (at least) and I usually pick up an extra treat or two from their well stocked counters. It's been more difficult to visit since I moved out of state, but I'll be there this Tuesday to stock up! Am looking forward to it. I'm originally from Kewaunee and grew up on Salmon's. They have the best wieners, brats, sausage and jerky!! I now live on the east coast and have an order shipped to me every January/February via Ron's Wisconsin Cheese. I travel throughout the USA. 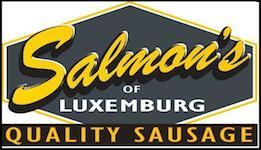 NO one makes sausage or wieners like Wisconsin AND Salmon's makes the best of all Wisconsin sausages & wieners. Truly the best of the best! Bringing a 10# box of wieners back to Florida. Don't get me going on the shaved ham or bacon...mmmmmm! Can I give you 10 stars? The best! Just need to have nutrition on the hot dogs and other products. Finally ! After trying every brand I could get my hands on I have found THE BEST BRAT, hands down none better ! I live in Appleton and a Shell gas station near my work sells the Jalapeno cheddar snack stick. Wow, I am addicted to these things. They are SO delicious. I haven't tried the bacon, but that's next on the list. combared the bacon head to head with Neuske bacon not even close.Salmons wins hands down!Have never eaten better.Yes the wieners are awesome too.